What a tremendous evening! Top shelf! First class! Good show! Pip, pip, cheerio, and all that jazz! 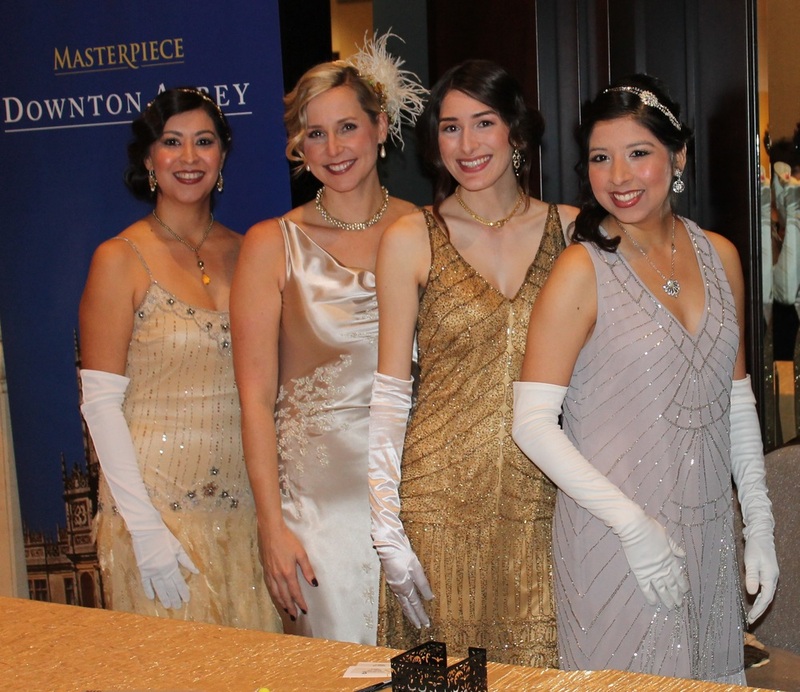 This year's annual KPBS Gala on January 11th, 2014, featured a Downton Abbey theme, and LEO DUO had the pleasure of providing ensembles for 18 KPBS staffers and event guests. A bevy of beautiful KPBS staffers greeted gala guests at the check-in table at the US Grant Hotel. LEO DUO customized vintage-inspired beaded gowns for each of our clients, changing hemlines, adding sleeves and straps, and of course, embellishing! LEO DUO sourced vintage and vintage-inspired apparel, then provided customization and alterations for each of our clients. We want each and every person we clothe to look remarkable AND feel comfortable. We realize not everyone is enthralled with the idea of a spaghetti strap or a plunging neckline. We used silks, metallic threads, and lace to create a variety of straps and sleeves, and even the occasional inset modesty panel. Each of the women we clothed was fully accessorized by LEO DUO as well, from the tops of their heads bedecked with unique hair accessories, to the tips of their be-gloved fingers. Choosing period-appropriate jewelry to coordinate with each gown was half the fun, and we even provided a few stunning handbags to complement the total look. In addition to fifteen women, we also provided ensembles for three men. Like Downton Abbey's valet Mr. Bates to Lord Grantham, LEO DUO chose white tie ensembles with features like pique front tuxedo shirts and period cut tail coats. KPBS Producers Club Member Lise Markham enjoying the festive atmosphere. Gala Event Chair Kimberly Heller and Thomas Wilcox, both clothed by LEO DUO. A stunning example of terrific teamwork. Make-up and hair by Brian Bond & team; hair accessories, jewelry, and gown by LEO DUO. At the event itself we were reunited with one of our favorite make-up artisans, Brian Bond, who assembled a top-notch team to do gorgeous hair and make-up for each member of the KPBS team. Brian has such an engaging personality - this, coupled with his enormous talent, makes him an absolute joy to work with. If you are ever looking for someone to do professional make-up for you, we recommend Brian whole-heartedly! LEO DUO was thrilled to be a part of the beauty of this event. Our kudos to Claudine Casillas, KPBS Special Event Manager, for putting together such a brilliant evening. We are already looking forward to collaborating with KPBS next year...cannot wait to see what the theme will be...!